Hi to all you new followers out there, and hi to all you followers-for-a-while! I updated my SMS Giveaway post with the winner, so please check back in. I do apologize for not replying to everyone's comments - there were a lot of you! So you know, I was a little preoccupied ;) That ornament accompanied the ring, as we swap ornaments with each other every year, so we can build up our stash of meaningful ornaments [see, I stash more than fabric]. I'd say this year became pretty meaningful! 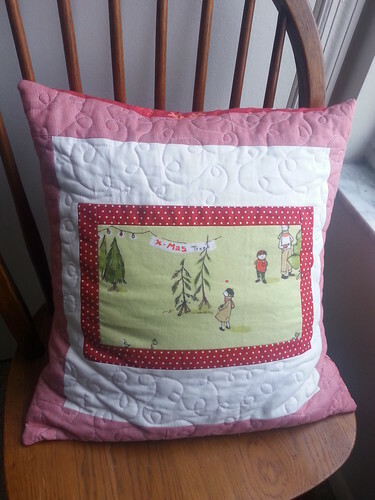 Munki Munki Christmas pillow - a new FMQ trial - I'm not so much a fan of it. The FMQing, not the pillow. I love the pillow! 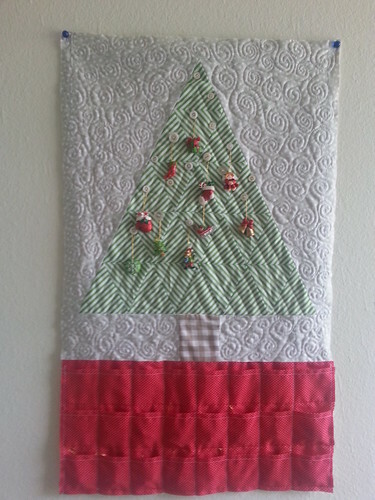 I have one Christmas project left to share, and it's probably my favorite story so far, so check back later in the week! Congratulations!!! This Christmas will be so memorable. Love the pillow and advent calendar. Did you use the Viking for your FMQ? The advent calendar looks amazing!! I love how you hang the ornaments on the tree. So cute :) and congrats again!! congratulations!!!!! what exciting news! 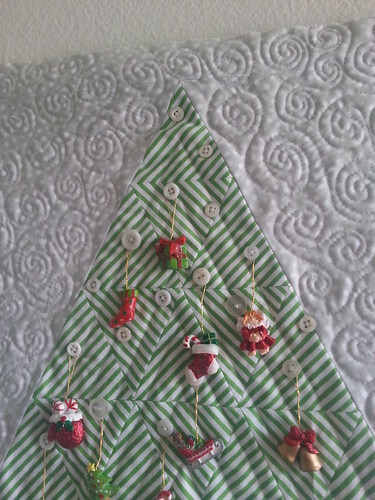 and i love your christmas projects, as usual you make incredible things, the advent calendar looks perfect! the best kind of distraction! Congratulations to you both! Congratulations! What a great way to start the holidays! 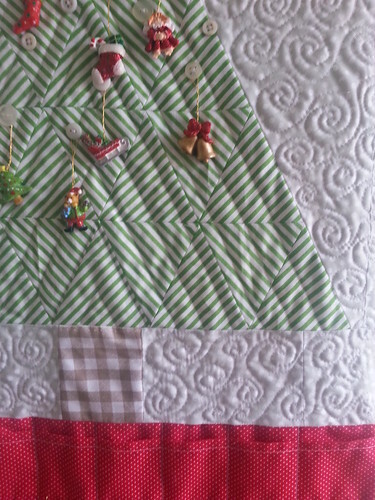 Love the pillow and the Advent calendar is just to o cute. 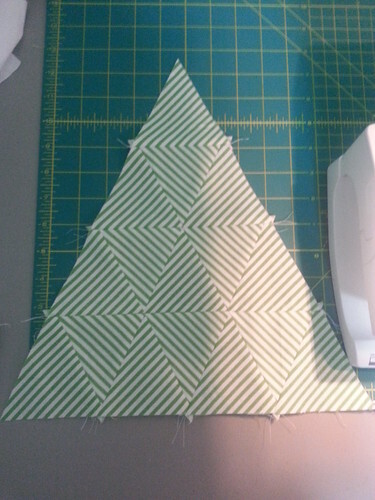 The use of the geometric fabric was perfect. Congratulations!! Stunning ring!! Enjoy this time before crazy wedding planning, its so fun! :) Happy Holidays!! Aw congrats! I love the tradition and I love that's how he gave you the ring :) Also I love all those projects...basically I love everything. :) Merry Christmas! 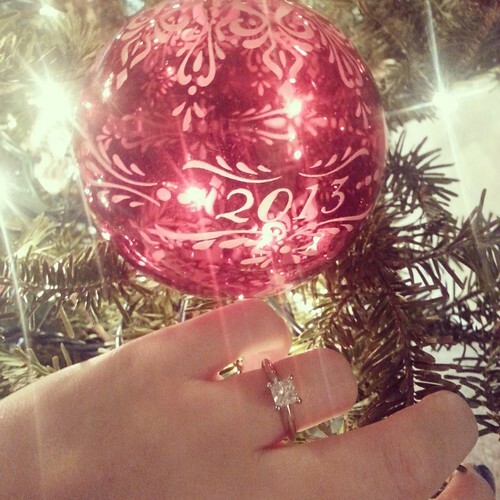 Aww YAY and congratulations! Also - Super cute advent calendar!